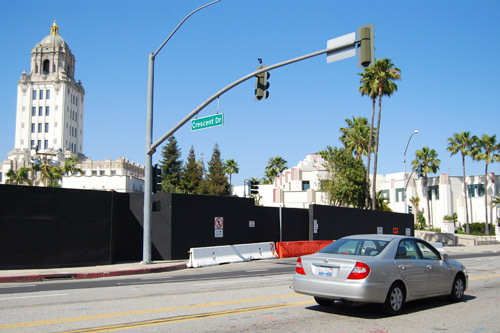 BEVERLY HILLS —The Beverly Hills City Council has announced that Crescent Drive between N. Santa Monica Boulevard and S. Santa Monica Boulevard will be closed while the Wallis Annenbury Center for the Performing Arts is under construction. The closure will continue until 2011, while the famed historical post office will be converted into a world-class site. The building’s accompanying underground parking structure is also being constructed, a three-level, 470-space, city-owned lot that will provide parking in the heart of Beverly Hills and also benefit the Annenberg. Residents and visitors in the area are asked to note that one of several streets running parallel to Crescent Drive can be used during the duration of the new venue’s construction, while the city will oversee the situation and institute traffic flow changes as needed. The city announces that every effort to lessen any negative effects from the construction on local residents is being taken. Special fences will be built to reduce noise, and procedures to mitigate dust from the construction site will also be conducted. The center is anticipated to open in 2012, welcoming visitors of all ages to a new program of enlightening cultural events and performing arts. Anyone with further questions may contact 800-658-4002, (24 hours).